Chompie’s, Arizona’s New York deli, officially commemorates the opening of its fifth and newest restaurant in Glendale with an all-day fundraiser and evening ribbon cutting. On Thursday, September Chompie’s will donate $5 from each dozen bagels sold at its Glendale location (7700 W. Arrowhead Towne Center #1145) to the Glendale Firefighters Charities. The organization supports community causes in Glendale as well as provides support to Valley firefighters in hard times and families of fallen police officers. A dozen bagels at Chompie’s is $10. Cream cheese is available at an additional price. For a special treat, members of the Glendale Firefighters Charity will be on hand from 9 – 10:30 am to pull bagel orders for customers. Chompie’s will also officially commemorate its fifth and newest location with a ribbon cutting ceremony. At 5:30 pm, Glendale Mayor Jerry Weiers will cut the ribbon at Chompie’s Glendale restaurant in the Arrowhead Towne Center. He will be joined by City Councilor Lauren Tomachoff and Glendale Chamber of Commerce President Robert Heidt, Jr. After the brief ceremony, the Glendale Firefighters Pipe & Drum honor guard will lead invited guests into the restaurant. The location is the fifth for Chompie’s and its first in the West Valley. Chompie’s has been Arizona’s New York Deli since 1979. It started when the Borenstein Family – Lou, Lovey, Mark, Neal and Wendy, came to the Valley from Queens, New York with a dream. 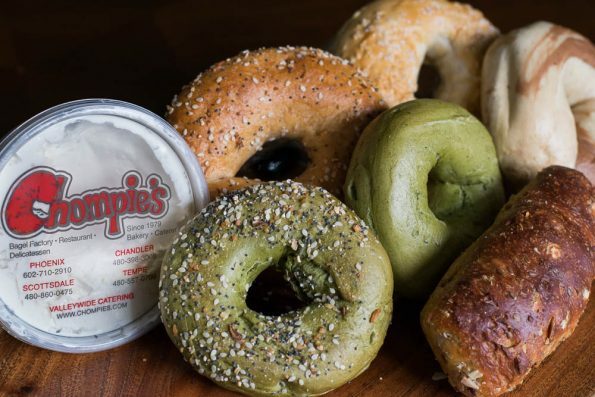 That dream materialized into a reality with Chompie’s, an exciting New York style deli, restaurant and bakery featuring freshly baked New York-style breads, cakes, pastries and, of course, bagels and bialys in 35 hot varieties. There are now five Chompie’s in Arizona in Scottsdale, Phoenix, Chandler, Tempe, and Glendale. For more information about menu and hours, visit Chompie’s online at Chompies.com.